I’m off to France for the next week, so that means two things for this blog: first, it means there won’t be an entry next week – unless I’m able to find a worthy American liquor over there and get into the blogging spirit, I suppose; and second, it means that in my anticipatory mood I’ve picked up a bottle of Clear Creek’s Calvados-inspired apple brandy to write about. 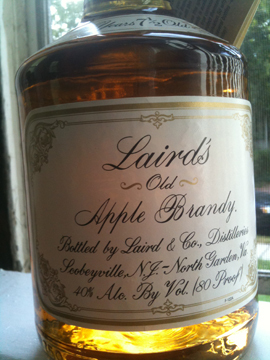 I first found out about Clear Creek’s apple brandy in the (perhaps not defunct?) New York Times blog Proof, where CC’s Steve McCarthy contributed a few pieces. I was never able to really get into that blog, which seemed to at once celebrate, nostalgize, and demonize alcohol – a confused premise at best. However, Steve’s pieces gave me a glimpse into the motivations and processes behind a respected American distiller, especially his emphasis on leveraging a region’s local produce in production. Now let’s get down to some tasting. Clear Creek’s Eau de Vie de Pomme makes no apologies for its Francophilia. Everything from the shape of the bottle, to the label coloring, to the script imitates the Calvados style. With that in mind, I enjoy the crisp lines and simple alignment of the text and border on the label, allowing the flowing script of the French title to stand out without cluttering. There is not too much information on the bottle itself except the age statement (8 years) and that it has been aged in French oak. EdVdP is light brown in color – a testament to its eight year aging – but is not as dark as what you might expect from some brandies (though certainly darker than the last apple brandy I wrote about here). The scent is strongly of cider and quite sweet. There might be a touch of the wood to the nose as well, but it was hard to pick out from the cidery notes. On tasting, EdVdP is bright and apply and lingers on the tongue with a tingling citrus and a bit of that French oak. Despite the apple and citrus, this was not as sweet as the scent would have you believe. Perhaps I’m not as adept at navigating the complexities of brandies just yet, or perhaps I simply shouldn’t expect as much from them in that manner as I should from bourbon. Either way, while Clear Creek’s Eau de Vie de Pomme is thoroughly enjoyable and I will visit the bottle again, I wasn’t able to draw as much character out of it as I would normally look for. What I can say, however, is that through the lens of my admittedly limited experience with brandy and Calvados in particular, Clear Creek seems to have done a good job in imitating the qualities of the French liquor. In the end, it could cetainly stand on its own legs without the comparison.